Widex is a Danish hearing aid manufacturer that got its start in 1956. In just over five decades, this family-owned business has grown into the sixth largest hearing aid manufacturer in the world. In 2012, Widex received the European Inventor Award for their work in advancing hearing aid technology. 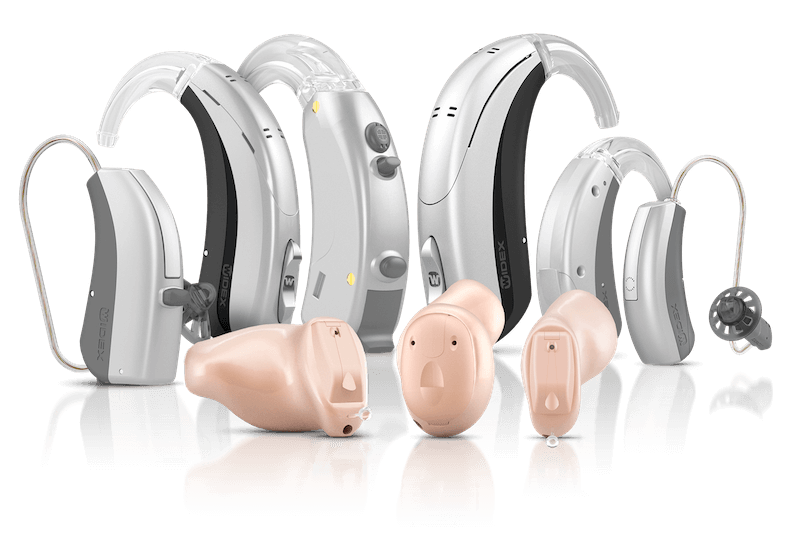 Widex was the first manufacturer to offer a fully digital hearing aid with wireless technology. Their trademark Widex Sound gives wearers natural sound and comfortable listening in any environment. UNIQUE hearings aids capture a wide sound picture for wearers – both soft and loud sounds are presented comfortably. UNIQUE is a favorite for those with active lifestyles, with its wind reduction feature to enhance speech in windy environments. With an automatic detection processing platform, UNIQUE picks up on the intricacies of the listening situation to make sure wearers hear the right sound at the right time. As a wireless hearing aid, UNIQUE connects to smartphones through the COM-DEX app, which allows wearers ease of control of volume and hearing aid features. This connection also allows wearers to stream music, media, and phone calls directly to their hearing aids. UNIQUE hearing aids are available in completely-in-canal (CIC) micro, CIC, in-the-ear (ITE), receiver-in-canal (RIC), and behind-the-ear (BTE). If you’ve been experiencing hearing loss for some time, the experience of reconnecting to sounds in your life may be a dream come true. This is the basis for Widex DREAM hearing aids: true-to-life sound that spans a wide spectrum to capture all sounds of the environment. DREAM enables wearers to hear detailed sound without distortion and to enjoy conversation even in the noisiest conversations. DREAM hearing aids are also equipped with features to help wearers locate the source of sound in their environment, whether it is from the side or from behind them. DREAM is a wireless hearing aid, and though connection with COM-DEX, wearers may stream music, media, and phone calls directly from their smartphone to their DREAM hearing aids. DREAM is available in CIC micro, CIC, ITE, RIC, and BTE styles. SUPER is a high-powered hearing aid designed specifically to treat higher degrees of hearing loss (severe to profound levels). Unlike many super-powered aids, the SUPER is discreet and small, while still packing a powerful punch. SUPER captures the full spectrum of sound in the wearer’s environment. With superior speech recognition and noise cancellation features, SUPER allows wearers to hear speech even in noisy environments. SUPER is a receiver-in-the-ear hearing aid with a long battery life and weather resistant design – great for the most active hearing aid wearers. Tinnitus is commonly known as a “ringing of the ear,” and it appears in approximately 90% of hearing loss cases. Tinnitus is the experience of hearing sounds without an external stimulus, and it can range from temporary to chronic. For many, the sounds of tinnitus are incredibly frustrating and distracting – and may even take a toll on one’s quality of life. Because tinnitus is commonly found with hearing loss, Widex has addressed this condition with their ZEN Tinnitus Therapy program. ZEN Tinnitus Therapy consists of four main parts to address the different aspects of tinnitus. Known as ZEN tones – which are synthetic sounds delivered through Widex hearing aids or a standalone device to provide acoustic stimulation. A combination of behavioral exercises and sleep management strategies. ZEN Tinnitus Therapy is available in select Widex hearing aids, and it is also available in a standalone device, ZEN2GO, for people who do not experience hearing loss and only tinnitus.